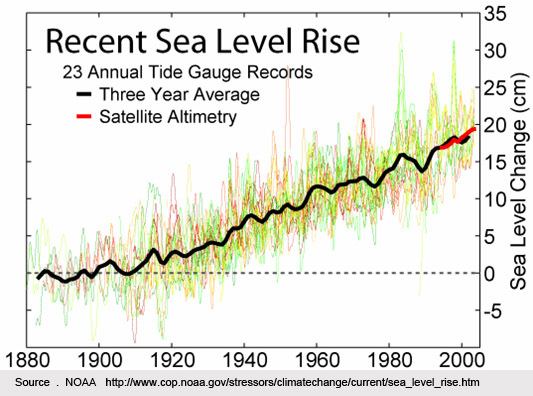 Sea level is rising and the rate of change is accelerating. The combination of warming ocean water expanding and rapidly increasing melt of land and polar ice has increased the rate of sea level rise from about 6.8 inches average during most of the 20th C to a current rate of 12 to 14 inches inches per century. Based on this increase in rate of change, scientists are estimating that by the end of this century, the oceans will be from 20 inches to more than three feet higher -- and increasingly the higher levels seem probable. "The big gorillas in terms of sea level are Greenland and Antarctica," polar glacier scientist Eric Rignot told Gary Braasch for his book Earth Under Fire. "The response of those ice sheets to climate warming will be bigger than predicted." Also, studies of many other past climate records show that at no time in the past 800,000 years, and perhaps much longer, has the CO2 concentration been as high as the present 394 parts per million (ppm). Jonathan Overpeck and coworkers, who figured out the temperatures during the last interglacial period, calculate that a continued increase in CO2 levels this century could bring us to a temperature equal to that which existed 130,000 years ago. At that time sea level rose several meters, fed by Greenland meltwater. Sea level is measured now not only by direct tide gauges, but by an array of satellites which measure the height of the open ocean where no tide gauges could be placed. 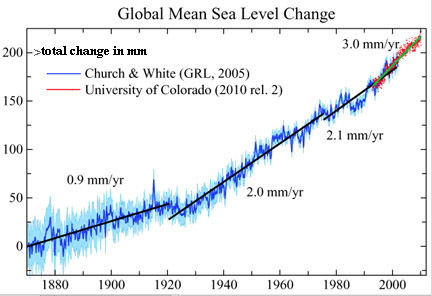 With the historical record combined with modern sea surface measurements, the rate of change of sea level can clearly be seen. The current rate of about 3mm per year is equal to about 12 inches a century -- double the rate for most of the 20th c. The acceleration of this rate is expected to continue, resulting in an estimated 30 or more inches (approaching a meter) of sea level rise by the end of the century. In the United States, said a report by the U.S. 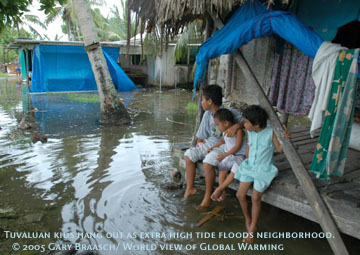 Climate Change Science Program in January 2009, "rising sea levels are submerging low lying lands, eroding beaches, converting wetlands to open water, exacerbating coastal flooding, and increasing the salinity of estuaries and freshwater aquifers." Four of the top 20 cities with populations and infrastructure assets most exposed to increasing sea level and storm damage are in the United States: New York, Virginia Beach, Miami and New Orleans (study by Robert Muir-Woods and colleagues; see first link, above. Other cities listed in this study are Amsterdam, Rotterdam, Alexandria, Mumbai, Kolkata, Ho Chi Minh City, Bangkok, Guangzhou, Shenzhen, Hong Kong, Ningbo, Shanghai, Tianjin, Osaka, Tokyo and Nagoya). World View of Global Warming has been documenting these changes since 1999, and in March 2010 we completed a re-photography expedition to North Carolina, Florida, and parts of Chesapeake Bay. 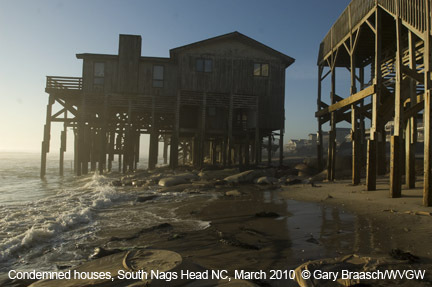 The lead photograph here, of houses condemned by county officials after a storm washed up to 70 feet of sand away from South Nags Head beach in late 2009, is featured in the Koshland Museum of Science in Washington DC. 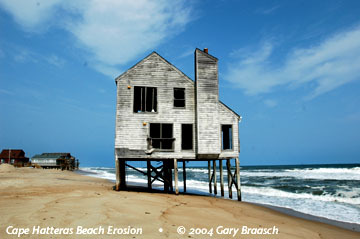 Coastal erosion eats away at North Carolina's Outer Banks and its homes. Successive views of 219 Altoona Street South, Nags Head NC, on the shore of Cape Hatteras. 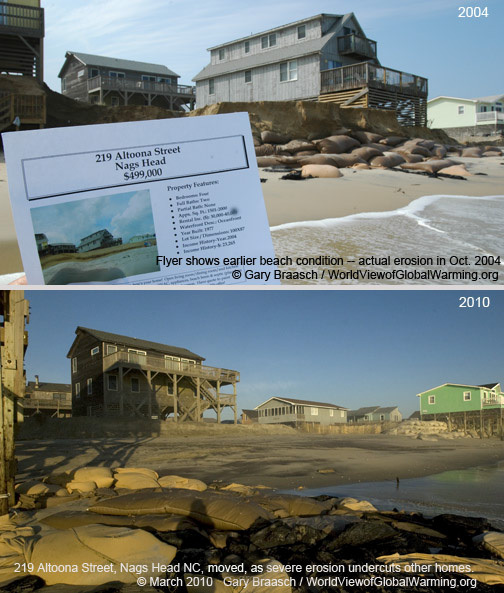 Sales flyer shows beach and grassy dune in front of house, but the actual condition in October 2004 was severe erosion far back under house and footings. By March 2010 erosion had pushed back to the next houses on street and left 9 other houses that were once on Sea Gull Drive completely separated from the dunes. The owner of 219 Altoona moved the house to an inland location in June 2009. 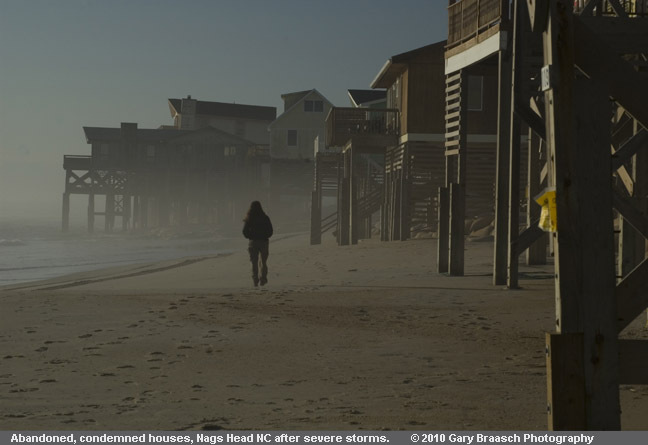 More than 20 other houses along beach to north and south of this house in south Nags Head are now in the surf, condemned by county health department due to damage to septic tanks or declared nuisances by the city. Increasing sea level rise foreseen in the coming decades will speed the natural processes of barrier island change and reformation. March 2010 repeat of 1999 and 2004 photos of the north end of Rodanthe, Hatteras Island, North Carolina, an Atlantic Ocean front community which has suffered extreme erosion and loss of beach and sand over the past 11 years (The 2004 and current views are from lower angle due to total loss of high dunes). 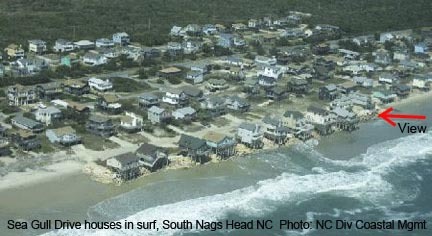 The changes in this time period include: Large house, named "Serendipity," has been moved after purchase by a new owner (new location is on the same side of the road, about a half mile south, back about one lot distance from previous position); eroded dunes at right of 2004 image have been cut down far enough to see the power poles and roofs they blocked from view. After storms in Nov 2009 and January 2010, this sand covered the access road and highway visible in 1999 photo, washed debris and house parts over, and piled up on inland (right) side of highway. Highway and access road have been bulldozed clear of sand as of March 2010. Note also loss of houses seaward of the central block of homes, visible to left of Seredipity in 1999 image. "The first stop on our trip will be to the Outer Banks of North Carolina. As we fly toward our destination, we see a fringe of dead trees stretching for miles in the water along the Albermarle Sound shoreline, a clear indication that sea level rise is drowning the forest edge. Flying over the Outer Banks, we observe islands eroding on both the ocean and sound sides, another sign of sea level rise. The islands are thousands of years old, yet won't exist much longer with such erosion. 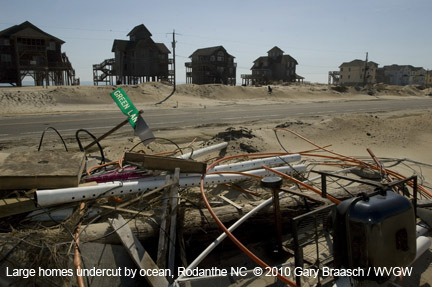 In Rodanthe, the island is so narrow and low that it can be washed over by something as slight as a lunar tide. Sea level rise has clearly changed this shoreline. To the south of Rodanthe, the US Park Service saw the futility of protecting America's most famous lighthouse from the eroding shoreline. 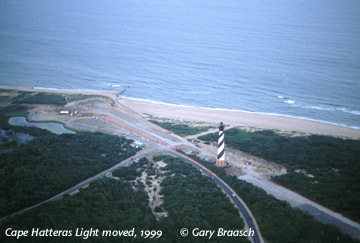 In 1999 it moved Hatteras Light back 2800 feet from the shore. The entire coast of Florida is threatened by rising seas and stronger surges during storms, which is already having high economic costs. Looking ahead only 40 years, a study in 2007 by Tufts University and the Stockholm Environment Institute—US Center estimated that Florida’s average annual temperatures will be 5º F higher than today in 2050. Sea-level rise will reach 23 inches by 2050, and 45 inches by 2100. 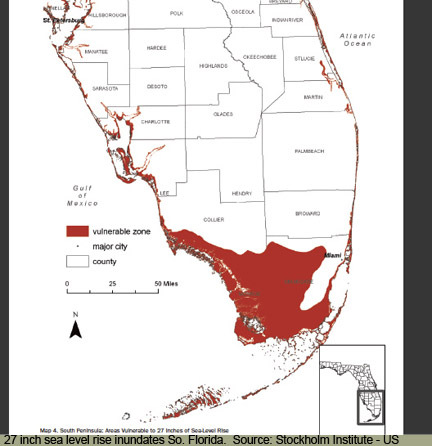 Maps in the report show an approximation of Florida’s coastline at 27 inches of sea-level rise, which is projected to be reached by around 2060 if little action is taken to control greenhouse gases. This casts doubt on the future of the apartments, businesses, public buildings and homes that crowd the Southeast Coast. Rising sea level is also driving sea water into the Everglades, inundating mangroves, and threatening all low lying islands. Thus Florida and the Keys are the U.S. equivalent of the many island nations of the Indo-Pacific who face rising seas right now. 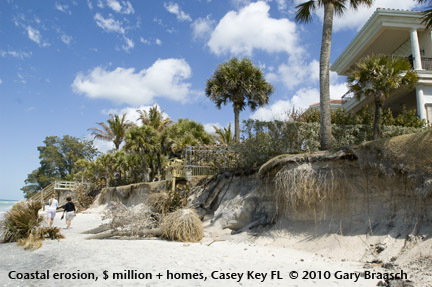 In some cases on the economically vital tourist beaches of Florida, severe erosion is counteracted periodically by pumping sand back onto eroded shores. 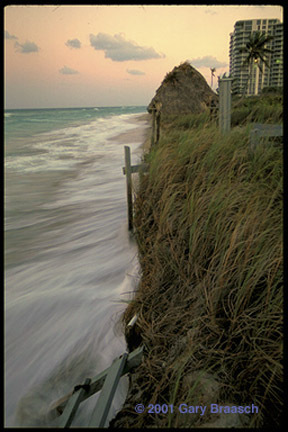 This sandy shore north of Miami at Dania Beach was being washed away by a normal high tide on a clear day in April 2001. This entire stretch of shoreline, focused on Hollywood Beach to the north, was replenished with 1,837,600 cubic yards of sand pumped in from off shore in 2005-6 at a cost of about $44.5 million. 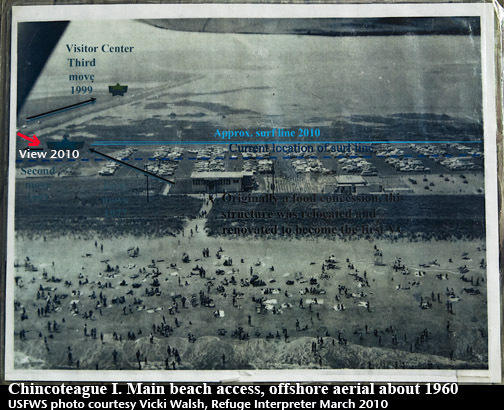 Previous beach restorations in this area since the early 1970s had cost a total of more than $38 million. Dania Beach as seen in March 2010 was becoming narrower again, however, according to beach lifeguards with a long history at that station; and news reports said the 200 feet of sand replaced along Hollywood's major hotels in 2005-6 was now down to 25 feet at high tide. 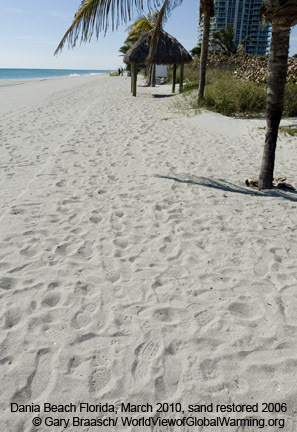 During the last 12 years, nearly $500 million was spent restoring Florida beaches. Most of the cost was borne by the Federal government. Florida economists estimated in 2005 that Florida's beaches generated 500,000 jobs and an annual economic impact of $19 billion. Slash pine forests (Pinus elliottii) in Florida, which are the habitat of the key deer and other endandered/threatened species, are being killed by salt water intrusion by sea level rise and storm surges. Michael Ross and colleagues reported that in the Key Deer National Wildlife Refuge, an 88 Ha (220 acre) pine forest on Sugarloaf Key has shrunk to less than 30 Ha (75 ac) since 1935, with a relatively continuous change to salt-water tolerant plants like mangrove. 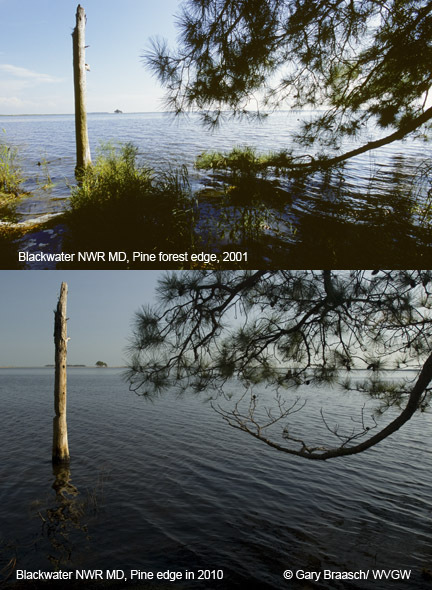 The 8 foot storm surge from Hurricane Wilma in 2005 left more salt water in the forest, speeding the death of pines. 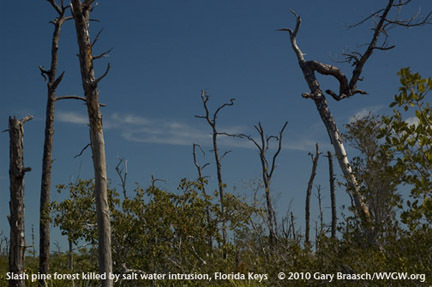 On Little Torch Key, a buttonwood forest is being pushed back by incoming salt and brackish water, leaving a widening band of dead trees with increasing numbers of black mangrove. Besides the Key deer, plants like the partridge pea and birds like the Cape Sable sparrow are very endangered by loss of these habitats in the Keys and up into the Everglades. 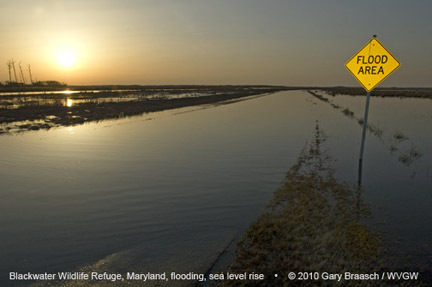 Flooding over a road on the edge of Blackwater National Wildlife Refuge, on the "Eastern Shore," of Maryland, caused by continued sea level rise in the Chesapeake Bay and heavy rains and spring run off, March 19, 2010. LIke most Chesapeake estuaries and coastal wetlands, the Blackwater is less than 1 meter above sea level. Since the 1930s, over 8,000 acres -- or 12 square miles -- of marsh at this refuge has been lost at a rate of 150 acres per year. The causes of this marsh loss include sea level rise, erosion, and salt water intrusion -- but also some subsidence and invasive species like nutria. The increasingly higher brackish water is killing pine trees and changing the ecosystem of the wetlands. The expanding area of open water can be shown to parallel the record of sea level rise over the past 60 years. This refuge is an internationally known example of loss of estuary and marsh habitat to sea level rise, and has been sited by the Intergovernmental Panel on Climate Change (IPCC). View along beach of Chicoteague National Seashore at main access near visitor center. Atlantic Ocean shore has been steadily eroding back since the 1960s and vistor center has been moved three times since then. 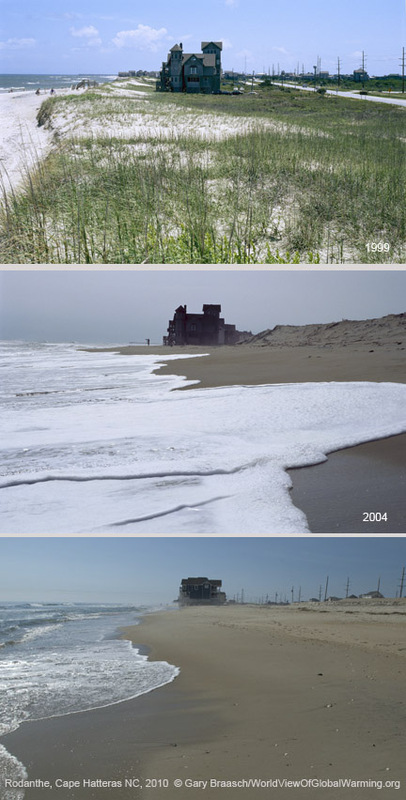 Fifty feet of beach was lost just in the November NorEaster in 2009. March 2010 view shows broken debris from former parking lots and electrical lines that once served bath house and restaurant -- which were at least 75 yards out, but now far into surf. Salt water has also intruded into the lagoon which had been fresh water. Pines are dying along lagoons and in lower forests due to this. And at the mouth of the Chesapeake, Skip Stiles, Executive Director of Wetlands Watch a nonprofit based in Norfolk, Virginia, is seeing the effects of sea level and storms on the Hampton Roads community. "Where I live, in Norfolk, Virginia, we have seen 1.5 feet of sea level rise over the last 100 years and, with southeastern Virginia being as flat as a billiard table and with settlements in place here for 300+ years, our communities are getting flooding that has grown measurably worse over time. We have old buildings that once were safe that now flood regularly. We have streets that were safe and dry when they were first paved out in 1920 that now flood twice a month on spring tides. We don’t need sophisticated models in southeastern Virginia, the most at-risk region from sea level rise outside of New Orleans. We get it and clearly see the cost of delay – yet what is the local political response? We continue to allow buildings along the shoreline. We pretend somehow the seas will recede before we have to pay the bills. We don't make the hard choices politically on land use or other economic investments. Instead, we still ask for better data before we decide. We do not have to wait for better models to get better data on climate change impacts here. We had a nor’easter in November producing a storm surge of 5 feet above Mean Higher High Water (above the average spring tide line). That gives us a snapshot of where the water will come with 5 feet of sea level rise – no modeling needed. Here the policy process already has enough information to act: where the pavement got wet, you should stop allowing development and withhold public investments in redevelopment." 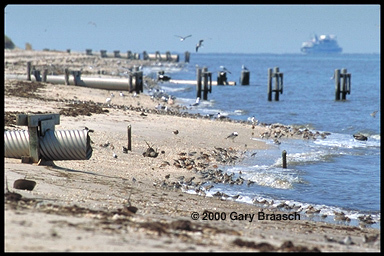 High tide on Delaware Bay presses migrating shorebirds against storm sewer outfalls near Cape May. The sandpipers, red knots, and turnstones that migrate to the Arctic in numbers approaching one million, already face declines in horseshoe crab eggs, their principal food along these shores. Rising sea level now is reducing the area for foraging, and could affect the success of this annual flight thousands of miles from South America to the Arctic. Also sea turtle nesting beaches are being eroded rapidly. Venice -- flooding of main plazas continues during winter storms. Tourists wading across the Plaza San Marco -- a common event in Venice, the European symbol of both rising seas and the difficulty of preventing damage to irreplaceable coastal cities. Venice has been sinking for hundreds of years, perched as it is on unstable sediments of the Lagoon. But the rising Adriatic Sea is rapidly exacerbating the problem. At the current rate the sea will rise a foot in this century. Italian officials made the decision to construct elaborate tide dams at Lagoon entrances. Environmental groups and some scientists warn that higher tide and storm levels will soon overcome these defenses, while the dams may isolate the Lagoon from the natural flushing it needs to remain a viable ecosystem. "The big gorillas in terms of sea level are Greenland and Antarctica," polar glacier scientist Eric Rignot told Gary Braasch for his book Earth Under Fire. "The response of those ice sheets to climate warming will be bigger than predicted." Also, studies of many other past climate records show that at no time in the past 800,000 years, and perhaps much longer, has the CO2 concentration been as high as the present 387 parts per million (ppm). Jonathan Overpeck and coworkers, who figured out the temperatures during the last interglacial period, calculate that a continued increase in CO2 levels this century could bring us to a temperature equal to that which existed 130,000 years ago. At that time sea level rose several meters, fed by Greenland meltwater. Sea level is measured now not only by direct tide gauges, but by an array of satellites which measure the height of the open ocean where no tide gauges could be placed. Asia's largest rivers, the Ganges and the Bramaputra, join in the world's most extensive delta and flow into the Bay of Bengal. 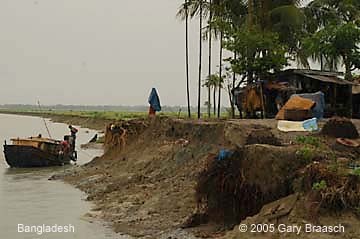 There lies Bangladesh, a nation of 140 million people beset by poverty and the floods of the rivers, and now also affected by rising sea level. Gary Braasch visited to document this threat, traveling by boat south from Dhaka and speaking to villagers, fishermen, and scientists. Already a million people a year are displaced by loss of land along rivers, and indications are this is increasing. Villagers spoke of losing a town mosque to unexpectedly fast erosion, even in a time of good weather in the dryer season. The one meter sea level rise generally predicted if no action is taken about global warming will inundate more than 15 percent of Bangladesh, displacing more than 13 million people and cut into the crucial rice crop. Intruding water will damage the Sundarbans mangrove forest, a world heritage site. Read the report here. For an update of this story, please see reports from 2011. The 11,000 Tuvaluans live on nine coral atolls totaling 10 square miles scattered over 500,000 square miles of ocean south of the equator and west of the International Dateline. Tuvalu is the smallest of all nations, except for the Vatican. Tuvalu has no industry, burns little petroleum, and creates less carbon pollution than a small town in America. This tiny place nevertheless is on the front line of climate change. 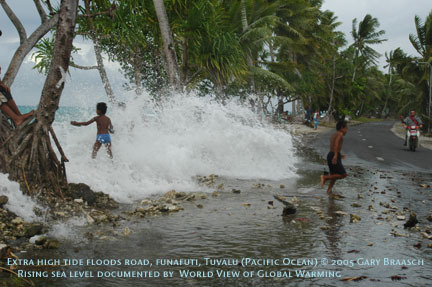 The increasing intensity of tropical weather, the increase in ocean temperatures, and rising sea level -- all documented results of a warming atmosphere -- are making trouble for Tuvalu. 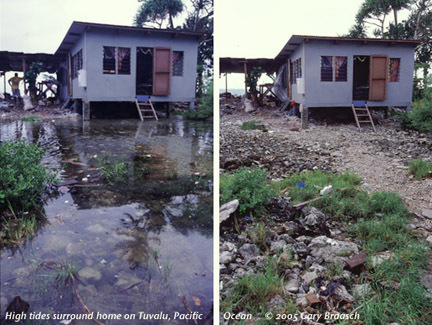 Tuvaluans face the possibility of being among the first climate refugees, although they never use that term. Former assistant Environmental minister and now assistant secretary for Foreign Affairs Paani Laupepa said he "Our whole culture will have to be transplanted." Sea level rise is the greatest problem. 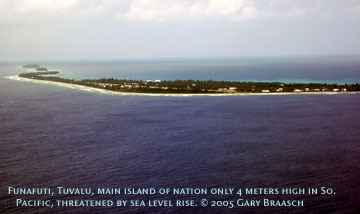 Tuvalu's highest elevation is 4.6 meters -- 15 feet -- but most of it is no more than a meter above the sea. Several times each year the regular lunar cycle of tides, riding on the ever higher mean sea level, brings the Pacific sloshing over onto roads and into neighborhoods. In the center of the larger islands the sea floods out of old barrow pits and even squirts up out of the coral bedrock. Puddles bubble up that eventually cover part of the airport on the main island of Funafuti and inundate homes that are not along the ocean. 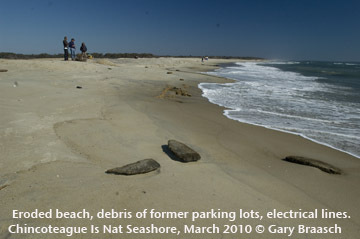 In February 2005, the tides were driven against the shore by unusual westerly winds, and there was increasing erosion. The main asphalt road is only about 10 km long, yet it runs right along the lagoon in many places and was covered in water and coral rocks thrown up by the tide. Hundreds of wood frame and corrugated metal roofed homes and several churches, built right on the lagoon, were drenched by the wind waves riding on the tide. The islands are not going to go under immediately --- that is unless a large storm hits at a high tide. Yet the effects accumulate, year by year. "Even if we are not completely flooded, " said Laupepa, "in 50 to 70 years we face increasingly strong storms and cyclones, changing weather patterns, damage to our coral reefs from higher ocean temperatures, and flooding of all our gardens." Not growing enough food and decreasing fish catch if reefs are damaged would mean "importing more food, " he said. Please contact requestinformation@worldviewofglobalwarming.org or Gary Braasch Photography (503) 860-1228.